Home › 7 Piece Portion Control Containers Kit + Guide + Free Pdf Planner! By Smartyo..
7 Piece Portion Control Containers Kit + GUIDE + FREE PDF PLANNER! by smartYOU for Food Storage/Meal Plans-Leak proof Perfect Size Color-coded BPA-FREE Plastic- Works with 21 DAY FIX! Best Value! NO MORE COUNTING CALORIES! - Perfect sized containers allow you to gain a good understanding of how to eat clean and control portion sizes without the madness of counting calories. Makes weight loss easy. PREMIUM QUALITY! - smartYOU Portion Control Containers are made from high grade quality propylene and are completely & 100% Leak Proof, Food safe, BPA Free, and DEHP Free! Top rack Dishwasher Safe, Microwave Safe, and Freezer Safe! Made to Work with 21 Day Fix, MAX 30, P90X systems! FREE GUIDE and INTERACTIVE 21 DAY PDF PLANNER INCLUDED! - Our GIFT to you for trying our product. A Free useful guide to show you how to use your containers as well as our Free 9-page smartYOU 21 Day INTERACTIVE Planner to help you plan your meals, track your progress and document your incredible journey to healthy living! The smartYOU 21 Day Planner includes a BODY MEASUREMENT TRACKER, SMART FOOD LIST, WORKOUT CALENDAR, and a DAILY MEAL TRACKER for all 6 calorie levels covered in our Guide. This instant PDF file is e-mailed to you as soon as your purchase is confirmed! 100% SATISFACTION GUARANTEED! - We stand by our products! If you're not completely satisfied with your purchase of this quality portion-control kit, simply let us know and you'll be offered a FULL refund or replacement, no questions asked. Enjoy this absolutely RISK-FREE purchase today by clicking the yellow 'Add to Cart' button above! - Are you tired of feeling exhausted? - Do you want to eat healthy without the madness of counting calories or points or weighing food? - Are you ready to commit to feeling healthier, lighter and more confident in your body now? 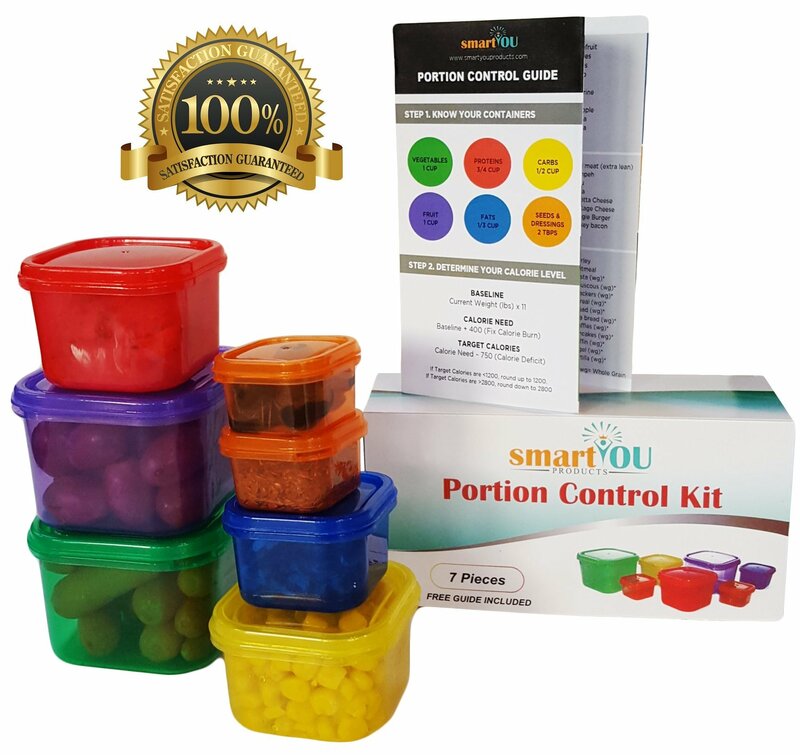 Let our SMARTYOU Portion Control Kit help you achieve your New Year's goal for a healthy lifestyle in 2016! - Color-Coded Premium Quality containers are BPA-FREE/DEHP-FREE, Microwave/Freezer/Dishwasher (Top rack) Safe. - Precisely measured to fit a balanced diet. Work with 21 Day Fix. - Fast results with minimal effort. Perfect for busy lives. - No guesswork! Just follow your plan, fill your containers, and enjoy your meal! - Stackable containers for convenient, space-saving storage - Free EASY-TO-UNDERSTAND Portion Control Guide Included.
? LIMITED-TIME BONUS OFFER (VALUE $14.99!) ? We here at smartYOU Products are dedicated to bringing you Premium Quality products at the Best Value. We stand by our products and are committed to your satisfaction. Rest-assured that your purchase is 100% Satisfaction Guaranteed!